We noticed the area when we were in the van going to the Underground River tour. The mix of smoke from burning dried leaves, the sun's dramatic yellow hue, and rustic houses in the village made it picture-perfect. "Viet Ville," our guide said. "Vietnamese refugees stayed there." Seeing how beautiful the place seemed plus the thought that there were Vietnamese refugees in Palawan excited us. We made a short stop there before heading back to the hotel. Unfortunately, Viet Ville was a disappointment. Viet Ville seemed like the perfect venue for a horror flick. The place wasn't very inviting. It was eerie. The grass was poorly maintained, see-saws were rusting, and the houses were in bad shape. Viet Ville seemed like the perfect venue for a horror flick. Not sure if this is a place of worship or a stage for community events... or both. This is a stage for various events--Christmas, New Year, etc. Thanks to V. Huynh for clarifying! There weren't as many Vietnamese refugees as I thought there would be. Silly me expected to see a flock of Viets wearing canonical hats. (LOL!) Well... I did see two men speaking Vietnamese! I assumed that they were refugees. 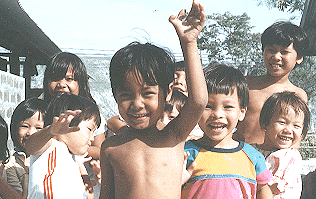 I also saw kids who looked half Vietnamese and Filipino. Towards the back of the village, a Buddhist temple awaits. Vietnamese refugees in Palawan is the reason why there are numerous Vietnamese restaurants in Puerto Princesa City. Tourists who haven't tried Vietnamese food in town may opt to try the food in Viet Ville. Let me warn you though: the food is mediocre and prices aren't exactly fair given the serving size. But it's pretty okay to hang out for an afternoon snack. Viet Ville Restaurant is open everyday from 9am - 9pm. From what I hear, their French Bread is a big hit, though you'll need to order in advance. Strolling around Viet Ville left a lot of unanswered questions: Why were there refugees from Vietnam? 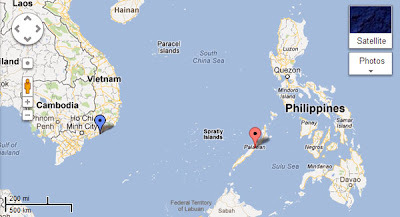 Why Palawan? How many were they? When did they arrive? Where are they now? What happened to the village? It's sad to visit a tourist destination that's poorly maintained especially if you feel that it's got so much potential. Obviously, this is an example. I don't wish for Viet Ville to be a must-go-to place just for the sake of being a tourist destination. I just feel that there are so many interesting things about Viet Ville worth sharing with people. Disappointingly, all these information, including my questions were answered by reading this blog! Would have been better if the answers were found in Viet Ville. The little bulletin board that had faded pictures and no captions didn't help much. Maintain it! Cut the grass, restore the houses, paint the structures! Restaurant should offer the best yet most affordable Vietnamese food in town. Play up the home-made French bread! Could be the reasons why people should go there. Could there be a possibility to turn Viet Ville into a mini villa resort? Not sure, though. Offer Vietnamese-themed pictorials around the village! Open a mini museum to share photos, history, and stories of the refugees. Even showing a map like this can give people an appreciation as to why Vietnamese refugees ended up in Palawan! Misconceptions can be corrected that Viet Ville was the first and only place for the refugees. 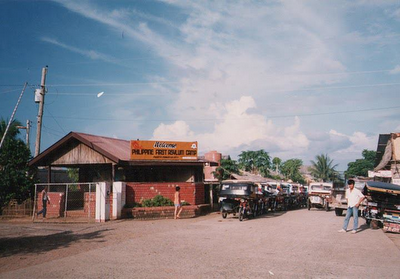 In fact, before Viet Ville, it was the Philippine First Asylum Center located near the Puerto Princesa airport. Survival stories from Vietnamese children can even be featured. Most of them are in different parts of the world now. 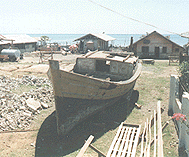 Imagine if an actual boat used by the Vietnamese refugees to come to the Philippines was on display! For those who have been to Viet Ville, what are your thoughts on it? For our 5D/4N itinerary, click here! To the anonymous person who I was having a conversation with about Viet Ville, our conversation box disappeared because of some setting stuff I did. So sorry! You're welcome :) and yes, I do keep in touch with some of the people via Facebook. There is also a Facebook group for the Vietnamese people who left Vietnam and came to the Philippines, through there, everyone can keep in touch with each other. And of course! You can certainly post the photos in your blog, I go by V. Huynh. Anyway, the 6th picture in your blog, that’s a stage, not a place of worship LOL. All types of events were being hosted there year round; Christmas, New Year, etc. Thanks for the clarification on the stage! Will correct it :) Hehe. sana sumagot sya para makita namin pictures. An Advocacy for Boy Wander?